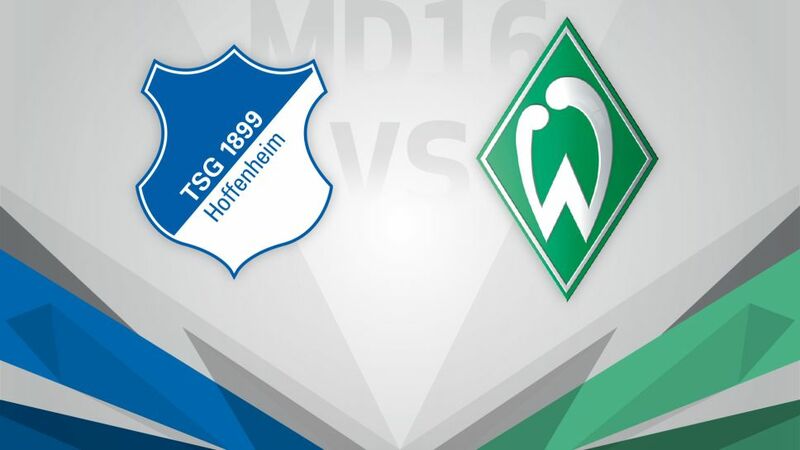 TSG 1899 Hoffenheim will be defending their outstanding unbeaten record when they host SV Werder Bremen on Wednesday (kick-off 20:00CET/19:00 GMT). Have you got your Official Fantasy Bundesliga team ready for Matchday 16? If not, click here. Julian Nageslmann and his side will be justifiably proud of their form during the Hinrunde, although that pride will be tinged with regret that they could not convert some of their nine draws into victories. Most recent of these was a gripping 2-2 draw with Borussia Dortmund, when the Sinsheim club were unable to take advantage of facing ten men for the final 50 minute. However, in Sandro Wagner they have one of the Bundesliga’s in-form strikers, who is sure to relish the chance of adding to his eight goals when facing his old club. Bremen’s Serge Gnabry is also in fine form right now, with six goals to date having equalised in the 1-1 with 1. FC Köln on Matchday 15 with a brilliant swerving effort. The Germany international has helped push Bremen away from the relegation zone, and if they could end Hoffenheim’s unbeaten run, the Green-and-Whites would occupy a relatively comfortable mid-table slot over the winter break.